Writing first appeared in South Asia during the 3rd millenium BCE in the Indus river valley, but disappeared from the archaeological record by the 2nd millenium BCE [1700 BCE]. 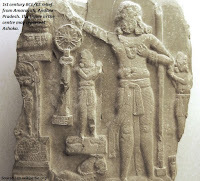 No other evidence of writing exists until 500 BCE and By the 3rd century BCE, Brahmi were inscribed in stones throughout the Maurya dynasty. Though,The first Indian script developed in the Indus Valley around 2600 B.C, It is still undeciphered due to Lack of bilingual texts (like a Rosetta Stone), as well as very short and brief texts as the average length of the inscriptions is less than five signs, the longest being only 17 signs.Thus,it is still not possible to fully understand this civilization, as we have no readable records of their beliefs, history, rulers or literature as Indus valley language has not been identified fully. It appears that the maximum number of Indus script symbols is about 400,although there are 200 basic signs (ie signs that are not combined from others). Further,the Harappan Numerals seem to represented by vertical lines, but they only go up to 7. Analysis reveal 4 more signs that appear in the same context as these numerals, and so they likely represent numbers higher than 7. The fact that no vertical-line numeral sign denotes 8 very likely means the Harappan language is based 8. For example, the Arabic numerals or Indo-Arabic numerals that we use has symbols from 0 to 9, and to write "ten" we have to combined the symbols 1 and 0, which identify our number system as based ten. This decimal numeral system was actually invented in India around AD 500. They were called "Hindu numerals" . They were later called "Arabic" numerals by Europeans, because they were introduced in the West by Arab merchants. Base 8 numerals or Octal numerals are rare in the world,but it does appear that early Dravidian is base 8,but later changed to base 10, possibly under Indo-European influence. For example, If we use base 8 instead of base ten, then 75 is written as "113" which denotes one sixty-four (8X8 ), one eight (1X8 ) and 3 units (instead of hundreds, tens and units) When translated, the count from 1 to 7 is familiar to us: "one", "two", "three", "four", "five", "six", "seven".However, above seven,the number's etymologies become non-numerical: 8 is "number",9 is "many minus one",and 10 is "many". closely resembles the Asokan Brahmi system. The third system of writing in Tamil-Brahmi inscriptions is the Tamil Pulli system. 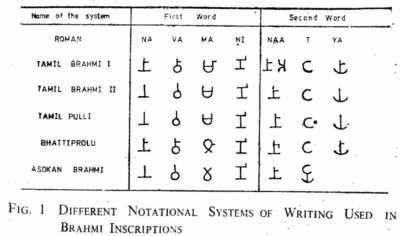 Therefore , the Tamil-Brahmi system I belongs to the pre-Asokan period and the Asokan Brahmi is an adaptation and elaboration of that system. For more details please refer :"The origin of the Tamil script ,Tamil Studies, Vol.2, No. 1, January 1982, 8-23 ,Editor, N.Subrahmanian, International Institute of Tamil Historical Studies, Madurai . Also,In an excavation at Kodumanal, near Erode more than 20 pot-sherds with Tamil-Brahmi inscriptions were found. On the basis of this archaeological work, some scholars suggested an older date for Tamil-Brahmi which would put it in the same period as Brahmi. Now there is new evidence from Palani which suggests 500 BCE as the date for Tamil-Brahmi. When K. Rajan, Professor, Department of History, Pondicherry University, excavated this megalithic grave, little did he realise that the paddy found in the four-legged jar would be instrumental in reviving the debate on the origin of the Tamil-Brahmi script. Accelerator mass spectrometry (AMS) dating of the paddy done by Beta Analysis Inc, Miami, U.S.A, assigned the paddy to 490 BCE. “Since all the goods kept in the grave including the paddy and the ring-stands with the Tamil-Brahmi script are single-time deposits, the date given to the paddy is applicable to the Tamil-Brahmi script also,” said Dr. Rajan. So the date of evolution of Tamil-Brahmi could be pushed 200 years before Asoka, he argued. 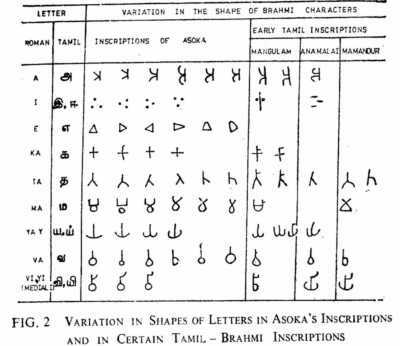 Also number of Inscriptions found in tamil is very much more than any other language.All these give evidence that Tamil-Brahmi I is oldest than Asokan Brahmi system.